High-speed rotogravure printing is fast and the length of printing paper is long. Once a failure occurs, the waste resulting from shutdown adjustment or startup adjustment is amazing. Causes of failures are manifold, one is influenced by the physical and chemical changes of the ink, the other is affected by the wetting state of the printing plate and doctor blade and the change of the depth of the printing plate, and thirdly, by the surface of the paper. Physico-chemical properties and the effects of the statically-distributed ink system; also affected by changes in machine operator operations and printing environment factors. I have been engaged in gravure printing quality control for many years, often visiting the site where the failure occurred, and I have made detailed records of the process of failure and the solution. How are these failures resolved, how are they generated, and how are the results? Let us take a look at the scene. First: Bad transfer of printing inks in fine texts. It was one night in summer, the weather was hot, the temperature and humidity in the workshop was high, and the relative humidity was close to 100%. In the course of the shift, it suddenly broke and stopped. After taking over the paper, the captain took over the computer and started the machine. Sampling a look, the black text of the small text was light in ink and the pen was severely deficient. The captain lowered the speed and let the deputy wipe the black version carefully. After the speed increase, the captain took a few samples to see if he was still not satisfied. The original small texts all "blocked". Generally speaking, the small size of the black version of the text is small, and the consumption of ink is also small. There is no need to add ink for a long time. As the volatilization of the ink in the solvent of the ink deteriorates, the plate is slowly plugged. In addition, the downtime in the shifts was too long, and the ink in the nets dried up. With the solvent wipe, the solvent evaporates rapidly and takes away a huge amount of heat. The moisture in the air condenses onto the plate. This is particularly evident when the ambient temperature and humidity are not ideal. The ink contains water and the ability to dissolve has deteriorated, and the ink has to be completely ejected. Clean the plate thoroughly with a decontaminating powder and clean it with a dry cloth. The ink was redistributed and a small amount of butyl acetate was added to it. After being turned on, the butyl acetate was quickly increased to more than 100 meters. The black text was fine. It is the key to the success of printing that the fine dot ink transfer in the printing of the level printing is normal. This is the second printed product. The used paper is 230g/m2 white paperboard. After the boot-up printing, the captain found that the small dots of the cyan version were more seriously lost and the white dots were too much. The effect of adjusting the ink viscosity was not obvious. The captain first compared the used paper and found that the surface of the printing paper was slightly rough. After the roughness of the paper reached a certain level, the electrostatic ink could hardly transfer the ink in the small cell to the paper, so the highlight part was white. More. The captain then looked at the printing unit of the cyan version and found that the embossing roller was not an electrostatic transfer roller. Then we did a comprehensive inspection of the entire electrostatic ink distribution system. Found that the brush has become agglomerated, some of the brush position can not touch the electrostatic ink roller, so he removed the brush to clean, check the static generator is normal, replace the non-static roller, replace the paper . Everything is ready, adjust the viscosity of the ink, speed up again after starting up to more than 100 meters, the fine network transfer normal, and the white point disappeared. From the third: how to print a good version suddenly "run version"
Print register stability is maintained by means of a tension control system and cursor tracking. The print condition of the cursor has a great influence on the stability of overprinting. In addition, printing pressure, drying temperature, ambient temperature and humidity have a great influence on the stability of overprinting. This is a summer transition to the autumn transition period. It is still hot during the day and the weather is cooler at night. In addition, the humidity is greatly reduced after a period of northerly winds. This time, the on-stage printing was a wide 80g/m2 coated paper and the product was a beer mark. The finest part of multi-layout typesetting is only the half-line (ie, about 0.15 mm). After the handover, the captain found that the middle group of printing units was running, and quickly adjusted the overprint deviation. The result did not respond. The captain checked the unwinding tension, winding tension, and tension between the printing units and found no abnormal tension. Later, when checking the cursor of the printing proofs, it was found that the cursor of the printing unit in the middle was not imprinted, and half of the cursor's first half was already dry, so that the cursor signal read out went wrong and the cursor following it appeared in turn. Wrong, so run the version. Finally, the position of the dancer roller was checked, and it was found that the dancer roller reached the top and did not respond to the input register deviation. In addition, the environmental temperature and humidity of the workshop have undergone major changes, the paper expansion rate has changed, and the dryness adaptability has also undergone major changes. It is normal that the overprinting is not allowed. There are several methods of adjustment: first adjust the viscosity of the ink to ensure that the cursor is printed intact, then adjust the drying temperature of each unit in turn, properly adjust the printing pressure and drying temperature, and properly sprinkle some water on the ground to increase the humidity of the environment. After reading the cursor is normal, adjust the overprint deviation, and adjust the printing speed appropriately to meet the paper stretching requirements, so that overprinting is normal. There are some hard particles on the surface of the paper. If the paper is treated with a cleaning agent, it cannot be removed. When the paper enters the printing unit, the plate is sometimes crushed, causing the plate to decompress. This time it was exactly a purplish-colored underprint that had already printed 500,000 sheets. After printing a new version, the printing color of the magenta-bottom sub-print was quite different from the original. The ink layer was thick and the hue was obviously darker, and the adjustment of ink viscosity did not work either. This has to ask the technologist to adjust the ink composition and adjust the printing hue by changing the ink color density. In general, a diluting agent is used to adjust the color density, and a fine-tune color toner is added to adjust the yellow, magenta, and cyan phases of the magenta ink, and the color inks can be used in gold, red, and yellow. In this way, the technologist needs to readjust the ink formulation, and the original adjusted ink is completely readjusted, which makes the captain's head painful. In addition to the impact on the output of shifts, the consumption of color palettes will be greatly increased. Jinmo's printing adaptability is relatively good, but unexpected failure sometimes occurs without paying attention. This failure occurred after the gold line was overprinted on the yellow background. Because of the poor adhesion of the gold ink, it easily adhered to the cooling roller. When the night shift was on, the captain thought that this kind of activity was better and the printing speed was higher. The yellow base version consumes a large amount of ink, the ink is updated quickly, and the printing ink has good adaptability. Golden ink has strong hiding power. Normal overprinting generally does not cause overprinting problems. After the superposition of gold ink, the ink layer is too thick and the peeling increases. If the drying is not complete, or the temperature of the cooling water is not suitable (higher), the attachment fastness of the gold ink will be affected. From the point of view of the gravure printing process of the paper, the ink is finally covered once and for all after the color inks are printed. If the overprinting ink in the intermediate color group is too thick, the attachment fastness may be insufficient, and the attachment of the gold ink may not directly affect the attachment fastness. Night sampling is not easy to find, in fact, to see the proofs side of the light to see. The original cooling roller was hot and stuck with gold ink. The oven blowing temperature was too low and the gold ink was not fully dried. When the captain stopped, the ink sticking on the cooling roller was completely removed, the drying temperature was adjusted, and the speed was adjusted to the proper speed. The problem was solved. Some of the more careless captains had hurt the cooling rollers with hard ink scoops, which made them more prone to sticking. Next, I would like to talk about the improvement of platemaking and printing on the issue of "conspicuous differences in the bold lines and the horizontal lines of light-colored border printing." Almost all the border prints show differences in the axial and circumferential directions, except that light-colored inks perform more clearly when printed. There is a gold border about 2m around the frame. Regardless of the type of layout, its circumferential and axial performance is not the same. The light yellow ink in the axial direction is more shallow and the lines are finer. The light yellow lines in the circumferential direction have good wetting effect along the direction of the squeegee. The ink is normally transferred, and the lines are significantly thicker than the axial direction. In addition, the plate supports the area of â€‹â€‹the squeegee in the axial and circumferential directions is not the same, which creates an inevitable difference. Prevention measures include the following: From the design point of view, there are a lot of cigarette bag design styles that like to use some fine thick line borders, which is just a gravitational expression. In fact, such light-colored lines can be avoided from the design. With respect to the plate making process, it is possible to utilize the strong hiding power of the gold ink and to make the embossed edge more than 0.5m, which actually equals the thickness of the line. In this way, axial or embossing is not true, and gold can be covered. In terms of ink, the method of improving the viscosity of the ink by increasing the color density can improve the wettability of the ink and the squeegee on the printing plate, so that the difference in the axial and circumferential ink transfer amount can be reduced. In addition, there is a way to properly increase the depth of printing plates, especially for thicker papers. In general, static electricity occurs in the winter and spring, and the weather is relatively dry. When the high-speed running paper rubs against the metal roller, static electricity is accumulated. When the static electricity accumulates to a certain capacity, it discharges to the surrounding conductors. From the printing of the proofs, filaments were generated around the fine lines in particular. At first glance, they appeared to be dirty with a squeegee. No good results were obtained after replacing the squeegee. What is more serious is that paper accumulates charges, which can easily result in difficulties in separating paper from paper sheets and even cause traffic jams. The most serious is that the accumulation of charge on the paper to a certain extent will cause a spark, if the solvent concentration reaches a certain level or even cause an explosion. Prevention of such failures can be achieved by spraying water onto the ground, adding a blower between the units, or using a direct earthing discharge to eliminate electrostatic faults. 14 inches Wall Clock is the medium size of wall clock.14 inches wall clock is very attractive for home decor and office decor. 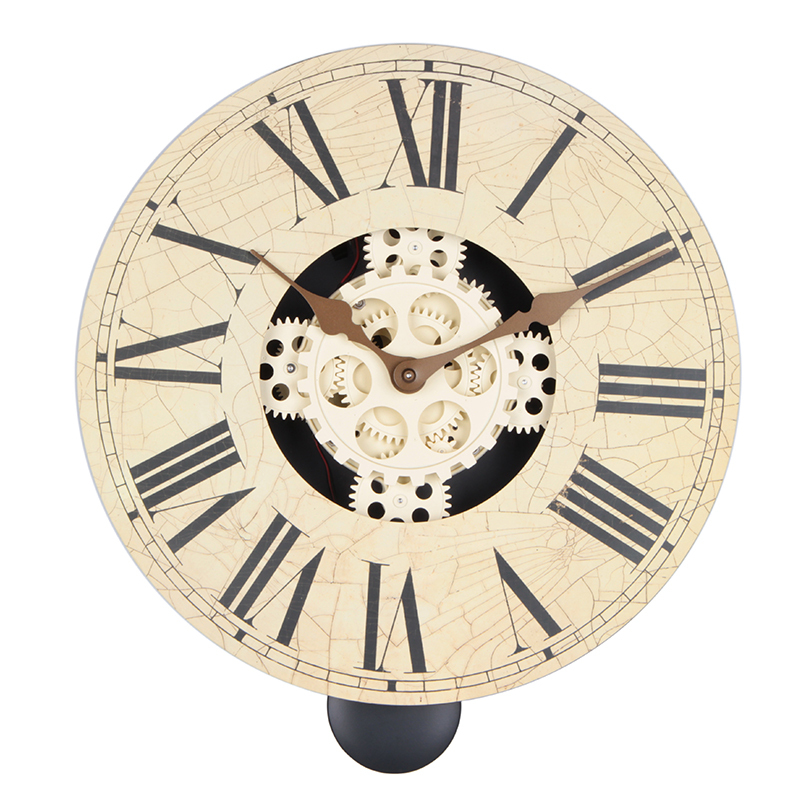 We have 14 inches clock in Gear Clock, bamboo gear clock, and ABS gear clock.The clock mechanism is made by our factory, not the universal one from market. Each clock we will pack with very considerable packaging, which we have done hundreds of times fall test. If you have any good ideas, you are always welcome to contact with us.